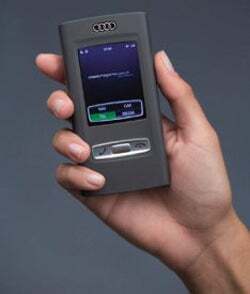 Audi has produced a concept device that will function as a cellphone, MP3 player, vehicle control system (It can start the car and adjust the music and climate control) and in-car navigation system (as well as locate your car if stolen or lost in a cavernous garage.) That is a lot of functionality under one roof. It appears, after the team let their functionality juices flow, they were fresh out of design ideas because the multi-functioning wonder looks like a rudimentary caveman's instrument for beating prey to a pulp.